On Wednesday morning we got picked up by the 4WD bus to be taken to the Kimberley’s. On the tour where mainly retired couples from Sydney/ NSW and one couple a little older than us, and a girl from Melbourne. 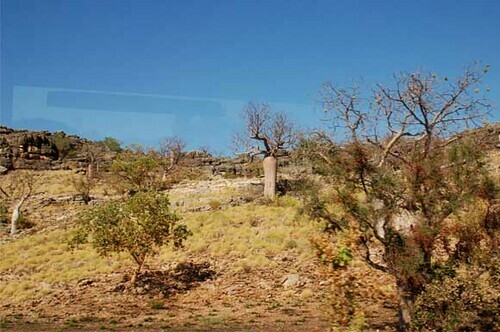 We traveled to Geike Gorge. 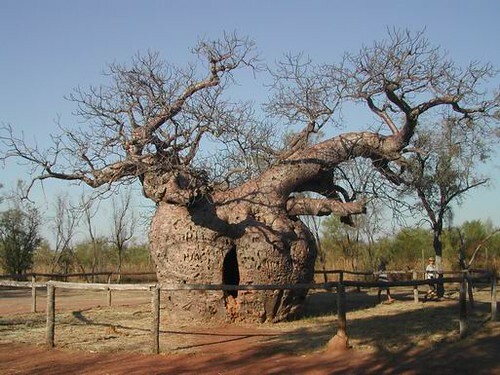 Along the way, we stopped to see termite mounds, a giant Boab tree that is predicted to be around 5000 years old. 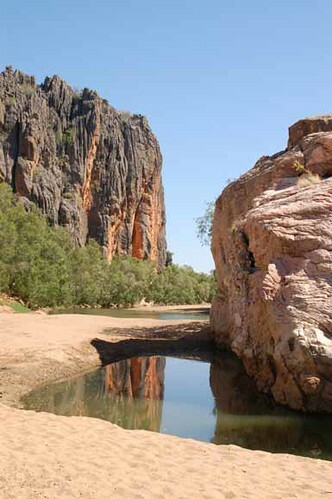 Then we drove on to the Fitzroy River the line on the cliffs is where the water usually gets up to during the wet season. 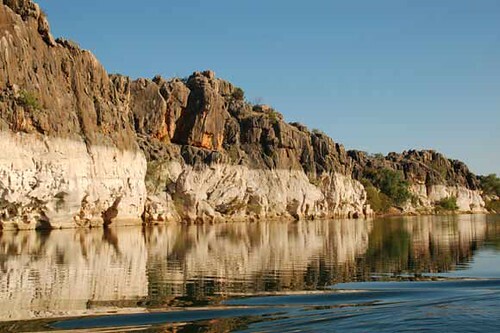 At Fitzroy Crossing we went on an entertaining Ranger guided cruise along Geike Gorge to see the spectacular cliffs and the freshwater crocs lounging around on the banks of the river. As well as the crocs we saw two wallabies up on the banks of the river. 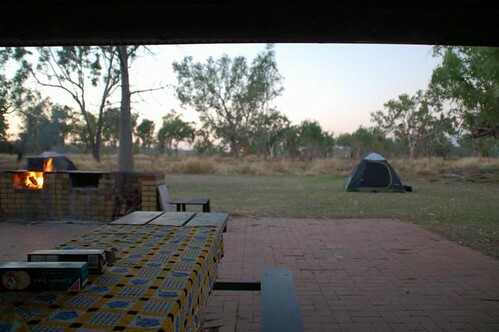 Towards sunset, we arrived at the Fitzroy River Lodge where we set up our tents and swags under the Kimberley night sky. Our guides Mark (who was from Wales) and Heather cooked a barbeque dinner. We fell asleep gazing at the clear black sky spattered by the Milky Way. After breakfast we traveled to Tunnel Creek, along the way saw the most beautiful scenery I have ever seen! I wanted to get out and explore at my own pace, but it all whizzed past in a blur. 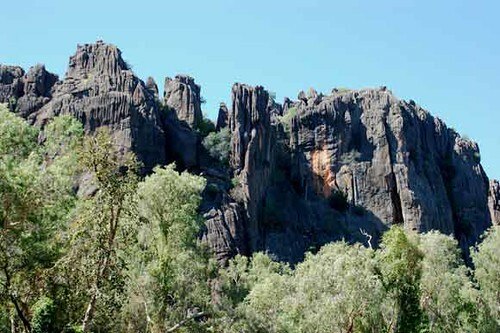 There where jagged rocky cliffs of the Napier Ranges jutting out of the earth (an ancient reef system which was under the ocean millions of years ago). 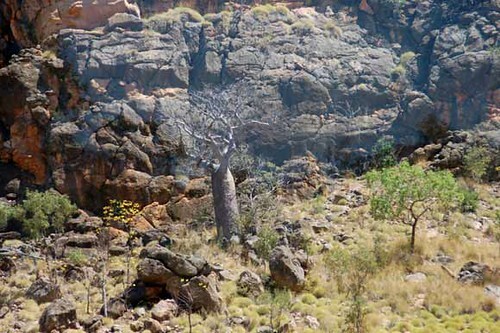 And there the beautiful Boab trees grow out of the yellowed grass and even out of the rocks themselves. There where spindly bushes growing all about with floppy yellow flowers and no leaves. 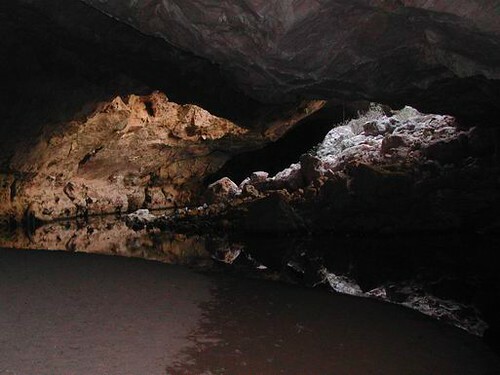 We arrived at Tunnel creek a 750-metre cave system carved through the Napier Range, a Devonian reef system 350 million years old. Here, we sploshed our way through the water in the dark and came out the other end at a natural pool. Two ladies went for a swim while the rest of us sat and took in all the life whizzing around us. There where bright orange/ red dragonflies and two Water Monitors. 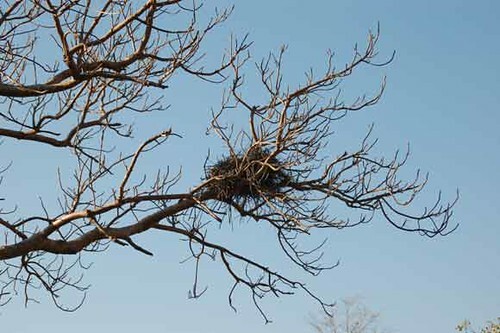 We saw two varieties of bats living near an opening of the cave. 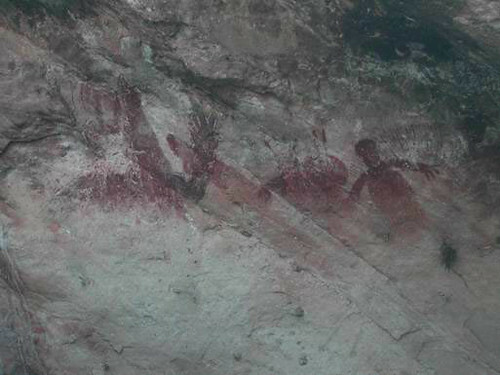 There are examples of Aboriginal rock-art all around these caves and outside. 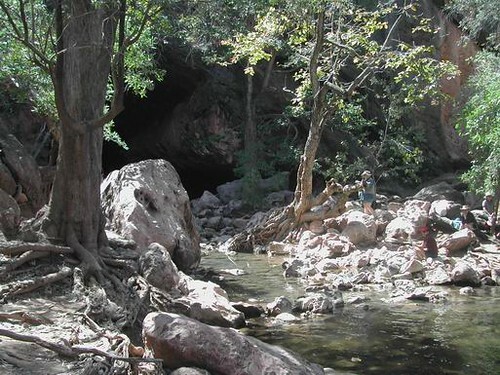 We also heard the story of Jandamarra, an Aboriginal freedom fighter who used the Tunnel as a hideout in the late 1800's. Mark then drove us to Windjana Gorge for lunch of cold meats and salads. 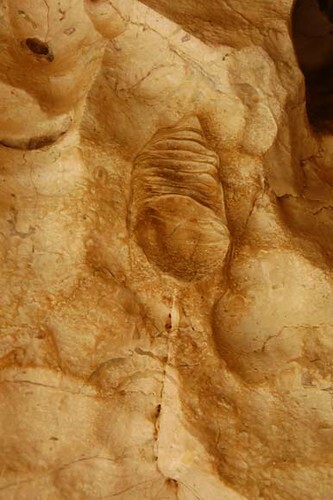 After lunch we walked into the Gorge where we saw the fossils of sea creatures in the rock face. The guide Mark showed us an ants nest made of leaves. 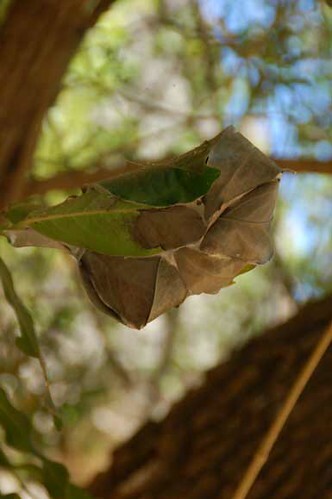 These green ants are eaten by Aboriginals. Apparently the abdomen of the ant tastes like sweet limes. Heading towards the water we saw a young trout fish and striped black and white fish. 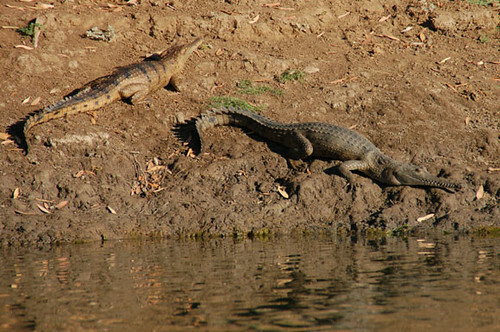 There are hundreds of freshwater crocodiles living in the waters along the banks of the river. 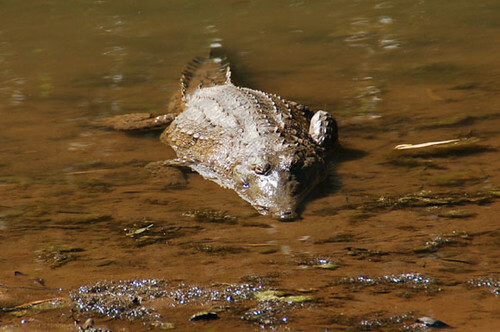 We walked along the beach and past the pink "Fertility Rock" and watched to crocs up close ( I stood 3 metres away). This large croc was eying off my skinny legs. 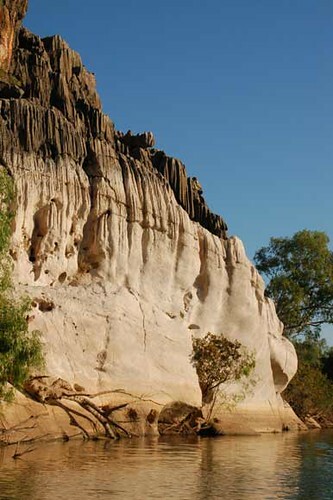 The cliffs of Windjana Gorge are lined with gum trees where white Corella's call to each other. On the way back to Broome we stopped at the traveling trough in the Kimberley cattle country. 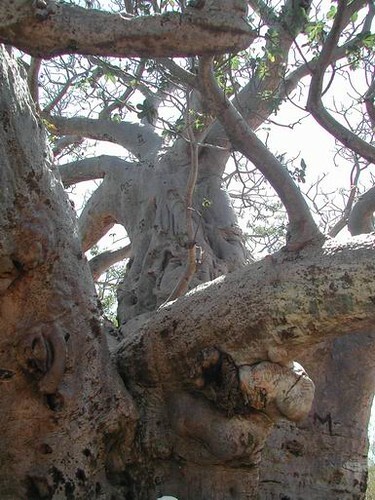 There we saw the infamous Boab Prison Tree were Aboriginal prisoners were kept. 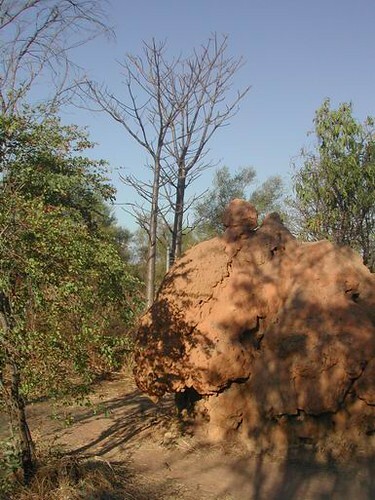 And a massive Termite mound.